Insect cells lack the ability to synthesize the sialic acid donor molecule CMP-sialic acid or its precursor, sialic acid. 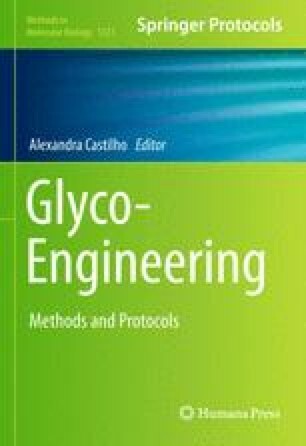 In this chapter, we describe a method to engineer CMP-sialic acid synthesis capability into Spodoptera frugiperda (Sf9) cells, a prototypical insect cell line, by recombinant expression of sialic acid synthesis pathway genes using baculovirus technology. Co-expression of a sialuria mutant UDP-GlcNAc-2-epimerase/ManNAc kinase (EKR263L), wild-type sialic acid 9-phosphate synthase (SAS), and wild-type CMP-sialic acid synthetase (CSAS) in the presence of GlcNAc leads to synthesis of CMP-sialic acids synthesis to support sialylation of N-glycans on glycoproteins.